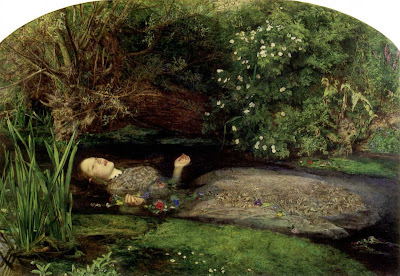 Ophelia is a painting by British Artist Sir John Everett Milliais, completed in 1852. Currently held in the Tate Britain in London, it depicts Ophelia, a character from Shakespeare's play Hamlet, singing before she drowns in a river in Denmark. It has a market value of £30 million, considerably more than the funding for my GRS which is becoming more of a tragic farce by the day. I feel rather like Ophelia today. All of my recovery towards better health & hope of a new life is unravelling after today’s further awful news. Worst of all my dear elderly parents are being distressed by seeing their daughter’s health deteriorate all because of what now appears a kangaroo courts sick charade of a forgone decision by my NHS PCT to refuse funding for my gender realignment surgery. I will survive, I will get there but right now I have gone from; singing with joy at my new life, to screaming out in pain, on a river of tears, trying desperately to keep my heavy heart from being pulled under for ever. Please God save me & my dear Mum & Dad from this cruelty. I have managed to bounce back & I will try to again. I need to stay strong for my parents. All may not be lost but after the events detailed below I am not sure where it will all end. As the consultant psychiatrist who kindly agreed to refer me for consideration for funding for my GRS with the surgeon Mr Phil Thomas at Brighton, is on holiday until Tuesday next week I took it upon my self to try & find out what the appeal process is after it was refused by the panel which met on Wednesday 7th January. I contacted the ECR Commissioning Trust today. I spoke to the person at the Primary Care Trust who had informed my consultant it had been refused. I received a letter from him dated 20th January which arrived on Friday 23rd & sent my health spiralling downwards. I was absolutely stunned to be informed by her that I only had 28 days from the date she informed him of the rejection to appeal. With him on annual leave for 10 days & then his secretary on leave when he comes back the prospect of sorting out this nightmare grows ever more unlikely. The appeal has to be made by the consultant psychiatrist in 28 days. I was told if that fails I would have to register a formal complaint with the complaints manager to take the matter further if I wished. After today I am not even going to wait to log my complaint at the PCT's action. As I have so little time to prepare more evidence it is very likely to fail again. The news that she was prepared to put a note on my file explaining the absence of my consultant on annual leave was of no comfort. To add salt to my gaping wounds she had the temerity to inform me I should have been told about the agreement the PCT had with West London Mental Health Trust Gender Dysphoria Unit to always send their patients to Charring Cross Gender Dysphoria Service, from the start of my treatment. As my treatment started in 1996 & was originally funded by the NHS her comment was ridiculous. Why this woman had the cruel audacity to ask my consultant just before Christmas why I did not want to go to Charring Cross knowing full well they had this agreement in place was sickening. Neither my consultant nor my own doctor has ever told me about this agreement. My consultant had been asking for clarification of how to proceed with a transsexual patient like myself via the NHS for over a year but to my knowledge was never told of this agreement. NEVER! I had continued to see my Gender Specialist Consultant Dr R. Curtis & attended consultations with the NHS surgeons who specialise in GRS Mr Bellringer & Mr Thomas privately to establish my preference as per what I had been led to believe was patient choice. Suddenly this woman acts as though I should have always known about this agreement with Charring Cross. I was a bit more than Charring ####ing Cross! I had been led along a path of false hope all along. All I can do is hope for a cancellation to see my consultant on Tuesday morning & have arranged to leave a note for him to urgently appeal their awful decision. I was contacted later the same day by my consultants lovely secretary who has advised me to log a formal complaint against the City Primary Trust with PALS the patient & Liaison Support. They have cut back all funding at her hospital & she was appalled at my treatment. I have an appointment with my GP on Monday. The mental cruelty the Primary Care Trust has put both me & my dear parents through, not to mention their apparent lack of communicating their supposed procedures/agreements to senior medical staff i.e. my consultant psychiatrist & possibly also my GP is unforgivable. I have been advised by my counsellor to contact my solicitors over this matter & will in due course be informing them of the situation. After so much excellent medical care to enable me to improve my health it is both negligent & tragic that a Primary Care Trust can treat a patient whose mental health has been stable for over a year so unfairly, causing great harm & distress, showing anything but primary care. Worst of all it is causing my elderly parents great stress as they worry about their daughters diminishing health. The bureaucrats & bean counting management are ruining our NHS & demoralising both their brilliant medical staff & the patients they are supposed to care for. Sadly this treatment of a transsexual patient is all to common a reason why patients often have to give up everything they own to go privately. They try to drag out the process so long that we just go away sometimes with tragic consequences. I hope PCT do not go on a witch hunt after the kind medical staff who have supported me. There is a risk they may be put under pressure to say they knew of this agreement & had actually told me. If I do not get this right I could be left without any care at all. I hoped to sort this out amicably but what choice have they given me? My problem is I do not actually have 28 days to appeal now, the clock was ticking from the day my SCPCT told my consultant psychiatrist which would be around 17-18th Jan.
1) Inform my consultant & his patient/me of their clandestine agreement with ChX . 2) They also failed to inform him or me of the process involved in referring a patient for an ECR or how to appeal if required, as in this case it clearly is. 3) They have completely disregarded continuity of care, my readiness for surgery, my right to chose where I go for my surgery, & the financial implications for the PCT. 4) They have willfully caused great distress to a patient who was stable & doing well with their recovery & in good mental health. 5) They have willfully caused great distress to the elderly parents of their patient. With my consultant on leave for ten days including the day I received the awful news, had I not decided to phone the PCT on the off chance to find out they would have happily said nothing & let the time elapse. How cruel & devious can they be?My poor Mums health is suffering as she is so worried about me. I try to stay at my flat when I am too emotional so she does not see me like that but being out of sight from her she worries even more. I am none confrontational & normally not a fighter but no one, NO ONE messes with the health of my beloved parents & gets away with it! It is my dear Mum I am really worried about. I will be ok my head is still above the water but please can someone help me? Hopefully your phone will start ringing very soon with those who can and do know something about going through all of this. It sounds very much like they are borrowing from the system that's taken root here of deny, deny and deny again! My heart goes out to you Debbie, I hope somehow in the next 3 weeks you managed to sort this! I've seen some strokes that have been pulled in this country. I've been on the end of a couple work wise, but this is disgusting. I hope you get the advice and support you need very soon. Thank you so much for your kind words of support. My problem is I do not actually have 28 days now, the clock was ticking from the day my SCPCT told my consultant psychiatrist which would be around 17-18th Jan. They neglected to tell him & his patient/me of both there agreement with ChX for at least a year & also failed to inform him or me of the process involved in refering a patient for an ECR or how to appeal if required, as in this case it clearly is. With my consultant on leave for ten days including the day I received the awful news, had I not decided to phone the PCT on the off chance to find out they would have happily said nothing & let the time elapse. How cruel & devious can they be? My poor Mums health is sufferng as she is so worried about me. I try to stay at my flat when I am too emotional so she does not see me like that but being out of sight from her she worries even more. I am not a fighter but no one, NO ONE messes with the health of my family & gets away with it!. Add that in having "an exclusive arrangement with on hospital for gender reassignment surgery when patients undergoing other elective surgeries presents illegal discrimination on grouds of gender reassignment." I am surviving & I guess that qualifies as coping just now. I am beginning to wonder if my transition which has taken over 12 years so far is ever going to reach the stage where I can just get on with my life. There was a time not that long ago when my world would have collapsed under the current strain. It was also true to say at that point if anyone had said a year ago I would now be desperate to have my grs or have had the most amazing year I have ever had in my life I would never have believed them. I had further bad news last Thursday that there is only a short time in which you can appeal. 28 days from the time they informed my consultant the outcome. No one had told me of this until I chose to contact SCPCT to establish the process as my consultant is still on holiday. So far the SCPCT have neglected to inform my GP , the senior consultant psychiatrist who referred me or their patient/me, the processes & agreements they now have in place for treating gender dysphoric patients or the details of the ECR process & subsequent appeals. The snow has presented another challenge today.It is very hilly where I live & traffic has ground to a halt. If I have to I will walk the 3 miles to my doctors surgery. I desperately need to have his advice & establish if he will support me. At least the surgery is open & I have an appointment with him. With my consultant I am unable to book an appointment & with more snow forecast it will be a case of phoning up first thing tomorrow to see if he has returned from his unfortunately timed holiday & see if he has a cancelation or just get over there & sit in his waiting room. I can cope, although there is an increasing feeling that my dysphoria & employment issues are closing in on me at the moment. I am none confrontational & am worried that by perusing a case which they can draw out as long at they like, I may end up with no medical cover at all. My consultant should launch my appeal tomorrow. I also have a complaint logged with PALS which is on hold until I get further medical advice. The SCPCT obviously hope I will go away & some how find a way to fund the GRS myself, which seems a sadly familiar story. I am tired but I also realise just how fortunate I am. My dear friend Katy's good news she is feeling stronger today is inspirational. One day I will be at peace with myself. How long it will take to get where I need to be is another question. If you read about someone being arrested for throwing snow balls at the Primary Care Trust's windows this week, you can guess who did it. My heart sank on reading your post. We seem to have to fight for every little thing. I never believed I had any hope of help and have wasted all chance of a decent life since an abusive consultation 40 years ago only now am I letting part of the real me out.I never got into the system but you are in and progress will be made but it seems to be fraught with illogical hurdles like an ultimate test, just hang on. II am sure getting into the SAS would be so much easier. If I had gone through the experience you must have gone through quite simply I would have been dead before I was twenty. The cruel arrogant phobic bullies who used to play games with dysphoric patients lives were monsters. ChX would have pushed me through hoops that would have quickly become a noose. I hope you can some how heal enough to be true to your heart. Bless you my friend. There but for the grace of God.